The number of Japanese tourists to South Korea increased at the fastest rate in nine years in 2018, even as conflicts over historical issues continue between the two governments. According to data from Statistics Korea, over two-point-nine million Japanese people visited South Korea last year, up 28-point-one percent from 2017. This is the steepest increase since the 28-point-seven percent growth recorded in 2009. 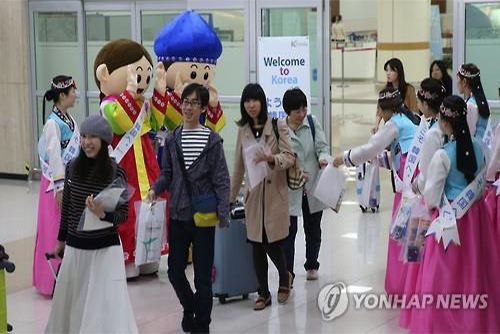 Meanwhile, the rise in the number of South Koreans visiting Japan has slowed from a year earlier. According to data from the Japanese National Tourism Organization, over seven-point-five million Koreans traveled to Japan in 2018, up five-point-six percent from the previous year. This increase is the lowest since posting negative growth in the wake of the Japan earthquake and tsunami of 2011. However, last year's figure still marks the highest since Japan began releasing related data in 2003. Japanese authorities believe the slowdown in the rise of Korean tourists is mainly due to natural disasters such as quakes and typhoons.